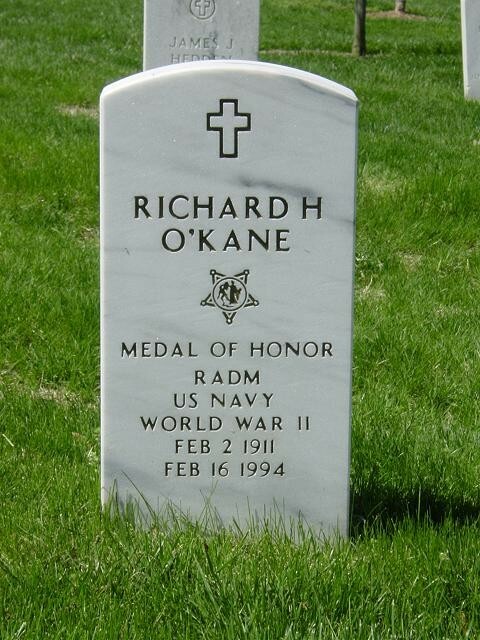 Richard O' Kane, a rear Admiral who was awarded the Medal of Honor as submarine commander in World War II, died of pneumonia Wednesday February 16, 1994 at a nursing home in Petaluma, California. He was 83. He retired in 1957, and was awarded the Medal of Honor for valor as commander of the USS Tang in South Pacific. The Tang sank a Japanese ship every 11 days on five patrols and rescued scores of US fliers who had been shot down in raids on Japanese ships and bases. During one patrol in Formosa Strait on October 24-25, 1944, the Tang sank 110,000 tons of Japanese shipping, including a destroyer. The submarine then fell victim to her 24th and last torpedo when it malfunctioned, circled back and hit the Tang, killing all but 9 of her 87-man crew. The commander and other survivors were taken prisoner and spent the last ten months of the war in a prison near Tokyo, where they were subjected to beatings and a starvation diet. After the war, he was promoted to Captain and commanded the Submarine School in New London, Connecticut, before retiring as a Rear Admiral and settling in California. In retirement, he wrote two books about his war experiences: "Clear the Bridge" in 1977 and "Wahoo" in 1987. Born in Durham, New Hampshire, where his father, Walter, was a professor at the University of New Hampshire. 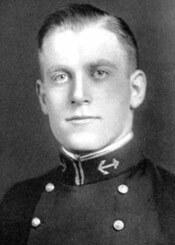 He graduated from the US Naval Academy in 1934. He is survived by wife, Ernestine, whom he married in 1936 and who lives in Petaluma. February 2, 1911-February 16, 1994. 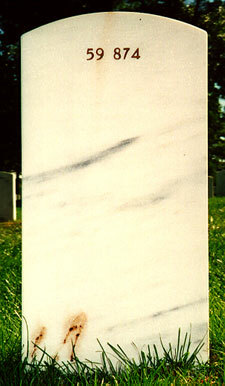 He is buried in Arlington National Cemetery, Section 59, Grave 874. Richard O'Kane weighed only 88 pounds when the captured submarine commander was released from a Japanese prison camp after World War II. This weekend, O'Kane, who went on to become a rear admiral, was honored as a genuine hero as Bath Iron Works' latest Aegis destroyer was christened in his name. "We have devalued terms like `hero' and `courage,' applying them loosely to athletes with multimillion dollar contracts and movie stars whose feats are no more then celluloid fantasies,'' said U.S. Representative Tom Allen. "The destroyer we launch today honors Richard O'Kane, a genuine hero from an age when heroism truly meant something,'' the Maine Democrat said during a launching ceremony. 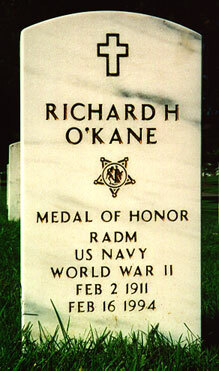 O'Kane was one of nine survivors after the USS Tang he commanded was destroyed by one of its own torpedoes. The submarine had just sunk 11 enemy ships during a fierce World War II battle. Two survivors from the Tang, William Leibold of California and Floyd Caverly of Oregon, were on hand Saturday as the Aegis destroyer bearing O'Kane's name was launched. bottle of champagne with a "clang!'' on the metal hull. The Aegis destroyer then slid into the Kennebec River. Outside, nine protesters who blocked a gate while people were trying to enter the shipyard for the ceremony were charged with obstructing a public way and trespassing, said Bath Police Sgt. Michael Field. Mrs. O'Kane, the ship's matron of honor, lived next door to her future husband in Durham, New Hampshire. When war broke out on December 7, 1941, Mrs. O'Kane was living at Pearl Harbor and her husband was on the first of three different submarines he would serve aboard during World War II. The USS Argonaut was sunk four months after O'Kane left to become executive officer of the USS Wahoo. That vessel, too, was sunk after O'Kane left to command his own submarine, the USS Tang. The Tang sank 33 ships - more than any other American submarine - before O'Kane's luck ran out. On Oct. 25, 1944, O'Kane's submarine was credited with sinking 11 ships during one battle while attacking a Japanese convoy in the Formosa Strait off the coast of China. But USS Tang's last torpedo turned out to be faulty. It turned around and struck the submarine. O'Kane did not talk much about the war, including the 10 months he spent in Japanese prison camps after he and eight other survivors were plucked from the water by a Japanese destroyer, she said. "The hardest thing for him the rest of his life was that he came home and his men didn't,'' Mrs. O'Kane said. Mrs. O'Kane said she considered her husband a homebody, the father of her children, a man who knew how to cook. She said he did not have much interest in the medals and honors that befell him after the war. The O'Kane, which is 505 feet long, displaces 8,300 tons and will one day carry 300 sailors, is the 16th Aegis destroyer to be launched at Bath Iron Works. It is scheduled for delivery next May. Rank and organization: Commander, U.S. Navy, commanding U.S.S. Tang. Place and date: Vicinity Philippine Islands, 23 and 24 October 1944. Entered service at: New Hampshire. Born: 2 February 1911, Dover, New Hampshire. For conspicuous gallantry and intrepidity at the risk of his life above and beyond the call of duty as commanding officer of the U.S.S. Tang operating against 2 enemy Japanese convoys on 23 and 24 October 1944, during her fifth and last war patrol. Boldly maneuvering on the surface into the midst of a heavily escorted convoy, Commander O'Kane stood in the fusillade of bullets and shells from all directions to launch smashing hits on 3 tankers, coolly swung his ship to fire at a freighter and, in a split-second decision, shot out of the path of an onrushing transport, missing it by inches. Boxed in by blazing tankers, a freighter, transport, and several destroyers, he blasted 2 of the tagets with his remaining torpedoes and, with pyrotechnics bursting on all sides, cleared the area. Twenty-four hours later, he again made contact with a heavily escorted convoy steaming to support the Leyte campaign with reinforcements and supplies and with crated planes piled high on each unit. In defiance of the enemy's relentless fire, he closed the concentration of ship and in quick succession sent 2 torpedoes each into the first and second transports and an adjacent tanker, finding his mark with each torpedo in a series of violent explosions at less than l,000-yard range. With ships bearing down from all sides, he charged the enemy at high speed, exploding the tanker in a burst of flame, smashing the transport dead in the water, and blasting the destroyer with a mighty roar which rocked the Tang from stem to stern. Expending his last 2 torpedoes into the remnants of a once powerful convoy before his own ship went down, Comdr. O'Kane, aided by his gallant command, achieved an illustrious record of heroism in combat, enhancing the finest traditions of the U.S. Naval Service.